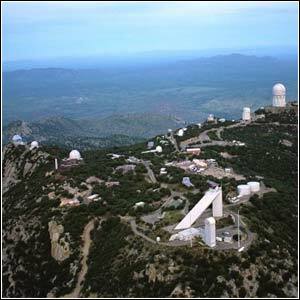 Kitt Peak National Observatory (KPNO) is an optical observatory at an altitude of 2,120 meters on Kitt Peak in the Quinlan Mountains 90 kilometers southwest of Tucson, Arizona. Its main instruments are the 4-meter Mayall Telescope and the 3.5-meter WIYN Telescope. Also on Kitt Peak are the McMath-Pierce Solar Telescope and the Solar Vacuum Tower, operated by the National Solar Observatory, and various instruments belonging to the Steward Observatory.